The Kerrick Riviera has been a highly successful unit over the last 25 years. 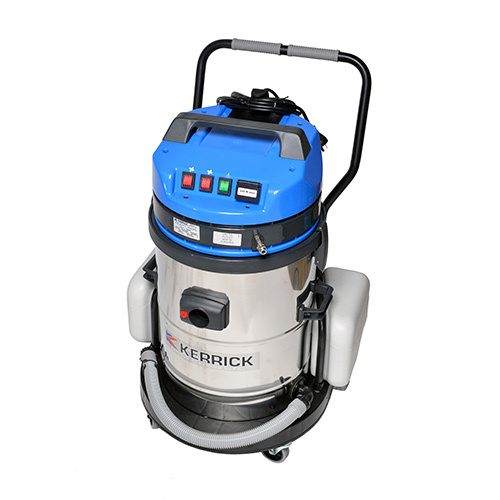 It has been widely used by contract carpet cleaners, the automotive industry and in the hospitality industry. The dual vacuum motors allow removal of 90% of all moisture from the carpet or upholstery thus allowing minimal drying times. The Riviera comes complete with a very functional 8 meter vac hose and a heavy duty, stainless steel carpet wand, and upholstery tool. This carpet shampooer has large capacity chemical and waste tanks, meaning the operator isn't constantly emptying/filling the tanks. Emptying the waste tank is made easier for the operator with a drain hose.